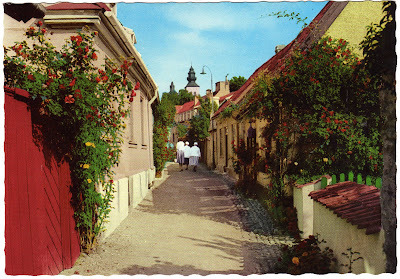 This is an undated, unused postcard from Visby, Sweden, produced by Pressbyrån. You know what I like best about it? No cars! It's a beautiful walkable community. Of course, the primary reason it's walkable is because Visby was around for a couple thousand years before cars. Visby, which has about 22,000 residents, is considered one of the best-preserved medieval cities in Scandinavia. It was known to be a center of merchandise as early at 900 A.D. Among Visby's most notable features is a long stone wall called Ringmuren ("the Ring Wall"). According to Wikipedia: "The work on the ring wall was likely begun in the 12th century. Around 1300 it was rebuilt to reach its current height, acquiring the characteristic towers, although some towers were not constructed until the 15th century." In 1525, the merchants of Visby were feuding with Lübeck and the Lübeckers burned down all of Visby's churches except the cathedral. Those ruins remain today, leading some to call Visby the "city of roses and ruins." And what is Fiskargränd? It appears to translate to "Fish Alley." Fish Alley is a street of Visby [and] is the most photographed. The area where Fiskargränd lies is popularly called "Fish root" from the 1600s onwards. Fiskargränd, adjoining neighborhood fishermen, has been used as a street name since the 1750s. Climbing roses, among other plants, were planted in the early 1940s. ... Fish Alley is just around the corner from the Botanical Garden. In December 2004 there was a citizen proposal that Fiskargränd be renamed to Rose Alley. The person wrote "that there are no fish there, but there are at least a thousand roses." The proposal was rebuffed by the Municipality of Gotland, which did not see enough reason to change the name. I have to agree with the Municipality of Gotland on that one. There's no need to change from the historical name. Fish Alley. Rose Alley. Either way, it looks like a wonderful place to live. So stick with the heritage of Fiskargränd. 1. Pressbyrån, which translates to Press Office, is a Swedish company that evolved from the Swedish Telegraph Bureau and is now primarily a chain of convenience stores. Pressbyrån had its own line of postcards from 1932 to 1966, which helps to give an idea of when this postcard was produced.